I WISH I HAD THOUGHT OF THIS…..!!! Aug. 12 (Bloomberg) — Used to be, Mercer’s ice cream wasn’t found far from the 60-year-old dairy in Boonville, a town of about 4,500 in central New York. $1 million. Employment is up from 20 four years ago. Foreign sales by small companies like Mercer’s are becoming a focus for economic development officials in upstate New York and other U.S. regions who are seeking a bigger slice of record exports to boost growth. Shipments abroad by businesses with fewer than 500 employees accounted for 32.9 percent of the U.S.
total in 2012, up from 29.2 percent in 2005, according to Census Bureau data. Continuing to move the needle means persuading more such companies that it’s possible to sell outside of the country. President Barack Obama, who pledged in his 2010 State of the Union speech to double exports in five years, created the National Export Initiative, in part to help small businesses sell abroad. There’s still plenty of room for improvement. Less than 1 percent of the nation’s 30 million companies ship outside the U.S., significantly less than other developed countries, according to the Commerce Department’s International Trade Administration. Of those that do, 58 percent sell to just one country. $2.28 trillion, increasing by almost $700 billion from 2009 to account for 13.5 percent of the $16.8 trillion gross domestic product, according to Commerce Department data. Selling goods and services abroad supports 11.3 million jobs, the data show. A report today showed confidence among small businesses increased in July. The National Federation of Independent Business’s optimism index increased by 0.7 point to 95.7, close to the almost seven-year high of 96.6 reached in May. A net 13 percent of respondents said they planned to hire, the highest share since September 2007. Skepticism is the main challenge in working with small firms to expand beyond the nation’s borders, according to Robert Simpson, president of the CenterState Corporation for Economic Opportunity in Syracuse, New York. He said he often tells business leaders more than 95 percent of the world’s population is outside the U.S. Demand from the global middle class will soar to $56 trillion by 2030 from $21 trillion in 2010, according to a report from the Organization for Economic Co-operation and Development. Toni Corsini, who helps jump-start exports by smaller firms as a New York-based loan officer for the U.S. Small Business Administration’s Office of International Trade, shares Simpson’s mission. She says her three-biggest obstacles among small business owners are fear, financing, and lack of faith. She works to alleviate all three from SBA’s Export Assistance Center in lower Manhattan, one of about 100 regional centers around the country. The office also is home to other federal agencies that assist with exports, making it a kind of one-stop shop. Frigid Fluid Co. took advantage of a Commerce Department program to help expand exports of its funeral products to 16 nations, adding Italy, Mexico, Poland and Spain over the past two years. President Brian Yeazel, whose family has had the Chicago-area firm for 122 years and five generations, says he’s turning to predominantly Catholic countries more geared to traditional burials as Americans increasingly choose cremation. Yeazel used Commerce’s Gold Key Service, which gives firms market research and arranges meetings with buyers on visits to the country. Trips cost $700 for small companies like Frigid Fluid, which has 17 employees; first-time users pay half price. Commerce Department specialists in 80 countries plan trips, attend meetings, and provide translators. Exports of products like embalming fluid and casket- lowering devices have grown to make up 34 percent of Frigid Fluid’s $4 million in annual sales, he said. While such small businesses add to exports, there probably aren’t enough of them to help Obama reach the 2015 goal of $3.1 trillion. Caroline Freund, a senior fellow at the Peterson Institute for International Economics in Washington, calls Obama’s initiative focusing on small firms misguided and impractical, given the export dominance of bigger companies such as Chicago- based Boeing Co., the largest U.S. exporter. Yet boosting exports is the missing piece of the full- fledged recovery in the U.S. economy, according to Ludovic Subran, chief economist at Euler Hermes Group. The Paris-based credit insurer pays companies if foreign customers don’t, tracking risk through 1,500 underwriters. Some business owners have doubts about repayment, a consideration when one big unpaid bill can threaten their future, said Laurel Delaney, the Chicago-based founder of GlobeTrade who’s been helping entrepreneurs sell abroad since 1985. Still, she says insurance can cut risk. At Mercer’s, Mignerey is working to expand in new markets, including Australia, Kenya, Puerto Rico, South Africa, South Korea, the U.K., Philippines and Suriname. Classification makes approval complicated because some jurisdictions call its wine ice cream food, others label it alcohol. Packaging needs vary. The hybrid product was born at a 2005 Washington event promoting New York Farm Day sponsored by Clinton. When attendees made ice cream floats with the wine from the next booth, Clinton and others suggested it may have a commercial future. Mignerey and Hurlburt, her aunt, introduced wine ice cream, which has about 5 percent alcohol content, in 2007. At a New York City trade show the same year, they met a Dutch distributor, who arranged their first foreign deals. They weren’t worried about payment because it was done in advance, but they were concerned about simple labeling errors, Mignerey says. Exports of the wine flavors began in 2008 with the Netherlands, though the company wants to also sell more traditional varieties abroad. Foreign sales help take the seasonality out of the ice cream business. In the production facility, four employees work year-round where previously winter staffing fell to two full- time and one part-time. In the office, four workers help with export-related administration, up from two. Ornellaia is confirming its place among the biggest names in wine sales as it celebrates 25 years of production. The Tuscan grower’s bottles are exceeding $2,000 a case as demand increases at auction. Buying interest in wines from Italy, Burgundy and California has picked up in recent months as demand eased from Asian collectors for top Bordeaux. The Ornellaia Vineyards. Wines from the Tuscan region show signs of increasing demand at auction with prices above $2,000 a case. An Ornellaia 1985-2010 25th anniversary bottle. The Estate was set up in 1981 outside of Bolgheri and the first vintage was produced four years later. Ornellaia is known for its Cabernet Sauvignon and other Bordeaux-style grapes. 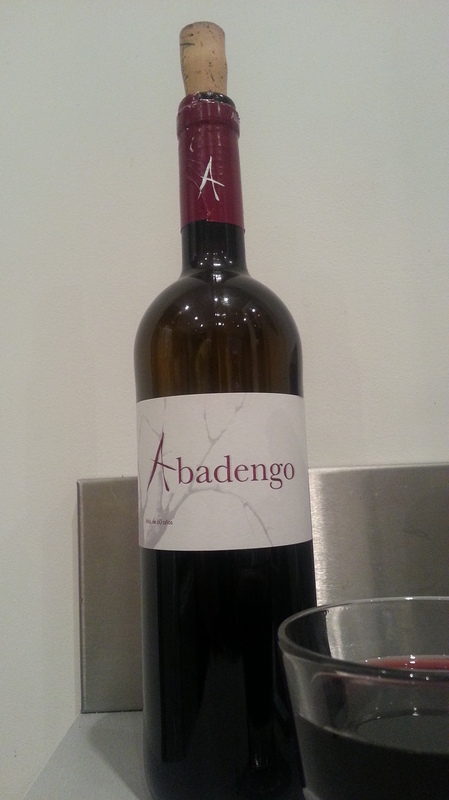 It also produces a single-vineyard premium Merlot, Masseto, sold separately by French merchants. The Ornellaia Estate was set up in 1981 outside the village of Bolgheri, close to the Tuscan coast west of Florence. Planted with vines the following year, its first vintage was in 1985. 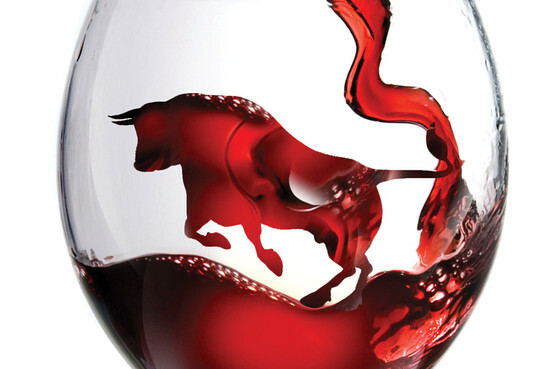 The Liv-ex Fine Wine 50 Index, a Bordeaux benchmark, fell 2 percent in the second quarter after gaining 7 percent in the first, and has slipped further during July to trade 4 percent up over the year so far. A case of Ornellaia 2004 sold for $2,214 at Acker Merrall & Condit in New York on May 22, while six bottles of Ornellaia 2005 fetched 1,112 Swiss francs ($1,150) at Christie’s International Plc in Geneva in May, the equivalent of $2,300 for a full case, according to data on the auction houses’ websites. On July 27, a case spanning six vintages back to 1993 fetched 1,547 pounds ($2,380) at Bonhams in London. The flagship brand from the main estate, Ornellaia Bolgheri DOC Rosso, is made from Bordeaux grapes Cabernet Sauvignon, Merlot, Cabernet Franc and Petit Verdot, under the direction of winemaker Axel Heinz. The winery has started marketing the 2010 vintage, a quarter-century after its first, and marked the occasion with a charity auction held by Sotheby’s at London’s Royal Opera House in May. The sale raised 238,500 pounds from bids on large-format bottles incorporating designs by artist Michelangelo Pistoletto, and followed a similar auction held in New York in February which raised $55,250. Since 1997, it has also produced a second wine, Le Serre Nuove dell’Ornellaia, using grapes selected out of the main wine, and now also makes Le Volte dell’Ornellaia, blending 50 percent Merlot and 20 percent Cabernet Sauvignon with 30 percent native Italian Sangiovese. Its vineyards cover 99 hectares (245 acres). According to Ornellaia’s website, Cabernet Sauvignon and Merlot vines cover 38 hectares each, with Cabernet Franc on 12 hectares and Petit Verdot on 7. There are also smaller quantities of white Sauvignon Blanc, Viognier and Petit Manseng. The company is investing in a new winery specifically for Masseto, so that it can operate as a fully-separate brand, with construction due to start early next year, according to Geddes. “Masseto will be completely stand-alone,” he said. Ornellaia was founded in 1981 by Lodovico Antinori. Bordeaux-based wine consultant Michel Rolland began his association with the vineyard in 1991 and it has been owned since 2005 by Tuscan wine group Marchesi de’ Frescobaldi. Muse highlights include Manuela Hoelterhoff on arts, Ryan Sutton on U.S. dining and Zinta Lundborg’s interviews. To contact the editor responsible for this story: Manuela Hoelterhoff at mhoelterhoff@bloomberg.net. Which wines go best with Pork? Americans may still eat more beef than pork — about 63 pounds per capita each year versus 48 — but the current foodie fascination in the U.S. with all things porcine has crowned the pig king. Yet unlike beef, which demands a big, brawny cabernet sauvignon to match its mineral-rich, juicy flavor, roast pig, sausages, and ham require a bit more thought as to what wine truly enhances the meat. This year, I decided to find out which wines would go best with a backyard roast. I collected a dozen bottles of various varietals. I had already eliminated a few I knew wouldn’t work, including those big cabernets, expensive pinot noir-based Burgundies and Super Tuscans. To some extent I relied on cultural tradition, that is, I asked myself what wine would be drunk by people who historically do pig roasts — Italians, Spaniards, Central and South Americans. I eliminated the Chinese, who tend to sweeten the meat with soy sauce, caramel and ginger. Pig roasts are certainly a part of the American South’s culinary tradition, but wine has never played a big role in that history. Rather like in the hillside barbecues called lechoneras outside of San Juan, Puerto Rico, where a cold Medalla Light beer seems to work wonders. Because I basted with a puree of garlic, onion, chili pepper, and orange juice, I needed a wine with tannic backbone and an undertone of sweetness to complement the richness of the meat. Those two characteristics happen to be part of the appeal of the best California zinfandels and their Italian counterparts, primitivos. A Joel Gott Zinfandel 2008 ($18) from Lodi and Amador had the right intensity, spice and peppery notes, providing a counterpoint to the smoke and basting juices. Primitivo is the Italian name for the same grape as zinfandel (both came from Croatia), and a 2007 example from Piana del Sole in Puglia, where the varietal has flourished, had a perfectly pleasant, cherry and raspberry component. Yet overall the wine didn’t do much for the roast pig’s big flavors. More complex but still a bit pale were two other Italian bottlings, a Masi Campofiorin Ripasso 2005 ($18) and Tre Roveri Pico Maccario Barbera d’Asti 2007 ($25), while a Spanish Mas de Can Blau 2005 ($42.50), a blend of carinena and garnacha, had the depth and brawn those grapes are known for, marrying well with the meat. My favorite match-ups were two Amarone della Valpolicellas. These wines from Italy’s Veneto region are made from corvina, rondinella and molinara grapes left to dry out on straw mats to achieve a raisin-like status, intensifying the sugars. A decade ago this traditional process resulted in unique, high-alcohol wines that tasted of leather, with more than a hint of sweetness and oxidation. Today the wines are better made, cleaner and intended to be drunk earlier, and the result is a wine of enormous body and 15 percent alcohol, but without the musty oxidation. I tried two Amarones, a Vaona 2006 ($44) and a Speri Amarone 2004 ($92). The former was right on target to match the big flavors of the smoky meat, melding fruit and soft tannins with fat and smoke. 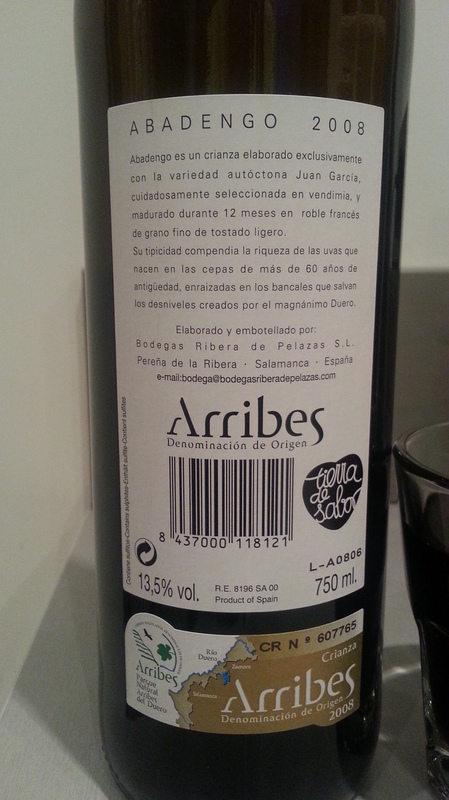 It is a silky, sensual wine and the meat seemed blessed by it. The Speri, considered one of the finest Amarones now made, has the benefit of aging, and its layers and layers of dark ripe fruits and its Port-like bouquet seem tailor-made to go with my backyard meal. At $92, it’s one you save for a special occasion — such as a major meal like this or a birthday — which it was: mine. The Chinese are buying California Grapes Now? I knew the Chinese were driving up the price of 1st Growth Bordeaux, but apparently they are also buying grapes to make their own wine. Interesting….This could be huge for Califorinia and the Governator is even getting involved. Cali certainly needs a boost in revenue. Chinese shoppers preferred California grapes over other sources, including Chinese-grown. Governor Arnold Schwarzenegger’s recent trade trip to China for the California Grown program highlighted the importance of the Chinese market for California products. In a 2009 survey, the majority of Chinese grocery shoppers preferred grapes from California over any other source, including Chinese-grown grapes. 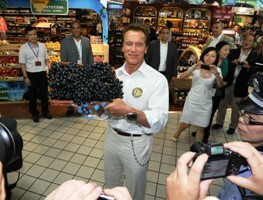 While visiting a market in Hangzhou, China, the governor posed with a basket of California-grown grapes (pictured) showcasing the high-quality California products available to Chinese consumers. Last year, China was the number two export market for California grapes with nearly 4.2 million 19-pound boxes of grapes shipped to that country. Canada was the number one export market. The California Table Grape Commission was created by the California legislature in 1967 to increase worldwide demand for fresh California grapes through a variety of research and promotional programs. More at grapesfromcalifornia.com. This recent Wall Street journal article outlines in a very simple manner the positives for wine invesment and how best to invest. I do agree with some of its tone, but not all. The article only really mentions ths First Growths for investment. This is fine, but there are many more wines worth investing in besides the First Growths of Bordeaux especially since they have become extremely expensive in the recent heralded vintages, 2000, 2005, 2009. I feel that other less acclaimed vintages are worth looking at as they haven’t appreciated as much. 2003, 2006 and especially 2008 trade much cheaper. You will have to have more patience with the less popular vintages, but they will increase. Also the second wines of the First Growths are starting to trade up in value, as well as some of the “Super Seconds” of Bordeaux, with names like Chateau Cos D’Estournel, Montrose, Palmer, and one could argue Pontet Canet even though it is only a Fifth Growth. They also fail to mention the Super Tuscan wines from Italy which also are worth buying for the long term, with names like Sassicaia, Ornellaia, Tignanello, and Massetto. Nonetheless, many people including myself are finally starting to realize that wine is a wise alternative investment vehicle, especially with bond yields so low, and waning equity markets. Top vintages have outperformed almost every other asset class over the past decade. How much longer can it last? The flowering of the vines in Bordeaux took place in unsettled conditions this year. The chances are that the region’s grapes will not all ripen at the same time. This in turn will make for a tricky harvest and – in all probability – a small, weather-affected crop for the 2010 vintage. There have also been a number of storms, which can lead to high humidity and the possibility of rot. This is not good. Read the complete Wealth Adviser report from The Wall Street Journal Europe. Traditionally Bordeaux’s early vintage forecasts were only of interest to a handful of oenologists and wine merchants. But given the returns being made on wine investment, far more people are now interested in the weather before harvest time in the world’s largest fine wine region. In the cellars of the most famous Châteaux that line the gravel mounds of the Gironde estuary in Bordeaux, the 2009 vintage has been maturing in barrel. This is undoubtedly the most hyped vintage since records began – eclipsing the famed vintages of 1961, 1982 and 2005. Even before the wine has been bottled, its value has already soared. Interest in wine investments is keeping pace. Those that bought the 2009 vintage early, through the futures based en primeur system are, in certain cases, already sitting on a paper profit. Figures from Fine + Rare wine brokers show that Château Lafite Rothschild 2009 has already risen 36% from £10,000 a case when it was released on the market in June to £13,657 today. Similarly Château Latour 2009, also produced in the commune of Pauillac, has risen 20% from £10,000 a case when it was released in June to £12,000 today. Château Lafite Rothschild 2000 has climbed 611% since December 2004 – when Fine + Rare first started compiling figures on wine investments. A case that would have cost £2,560 in 2004 is now worth £18,400. Château Petrus 2000 has climbed 255% from £12,000 in December 2004 to £36,627 today giving the buyer a return of £24,627 a case. It is not difficult to see why those with a spare £100,000 in the bank are increasingly being tempted to take a punt on some of the world’s finest wines. 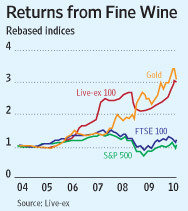 Live-ex’s Fine Wine 100 Index, the London International Vintners Exchange, which tracks the price movement of the world’s 100 most sought after wines, has climbed by more than 200% since it was launched in 2001. That’s a remarkably resilient performance during a period of such economic uncertainty. Wine brokers put this down to the fact that fine wine is a luxury product that people aspire to own. Crucially it is limited in supply: Château Lafite Rothschild produces around 480,000 bottles a year; Château Latour, only around 350,000 bottles. And unlike other luxury items, production cannot be increased because the vineyard areas are more or less fixed. As demand increases supply diminishes because as many, if not more, people want to drink the best vintages as invest in them. In recent years, these increases have been turbocharged by interest from the Far East most notably mainland China and since 2008, Hong Kong. In that year the Hong Kong authorities abolished all import duty and taxes on wine. This fuelled a huge boom in the Asian market. Wine merchants Berry Brothers & Rudd, who also run a brokerage department, are just one of a number of European merchants and auction houses that have set up offices in Hong Kong. Adam Bilbey, direct sales manager with Berry Bros & Rudd in Hong Kong says the wine industry has only just started to scratch the surface of the potential Asian market. He says: “There has been a huge increase in interest, which started with Hong Kong but has now spread to mainland China. It is driven by the über-wealthy looking for luxury brands.” Many are buying wine to drink or give as gifts, according to Mr. Bilbey. So given that there are significant returns to be made, how does one go about creating a wine portfolio? Firstly, it is important to choose your Châteaux carefully. Only a very small number of wines have investment potential. Experts say the highest returns can be found among the very top wines in Bordeaux’s Medoc region, classified as First Growths: Châteaux Lafite Rothschild, Latour, Margaux and Mouton Rothschild and Haut Brion, although the latter hasn’t performed as well as the others. A handful of wines from the other side of the river in Bordeaux – most notably Château Petrus, Le Pin, Cheval Blanc and Ausone – can be added to this list. Outside of Bordeaux, a few of the very best wines in Burgundy such as Domaine de la Romanée-Conti and Lalou Bize Leroy can offer significant returns. There are also a handful of Rhone wines and Champagne houses. Mr. Bedini says: “If you are looking at it purely for investment then my recommendation would always be to look very exclusively at a small number of Bordeaux wines from 2009, 2005, 2000 and 1996 vintages. By far the best way for private investors to purchase Bordeaux is through the summer en primeur campaign when the wines are offered a year ahead of bottling and shipment, having been tasted from the barrel. The upside to this is that you can secure allocation and favorable opening prices. The down side is that the prices can fall if the wines fail to live up to the initial hype. The price of a wine is largely determined by its quality. 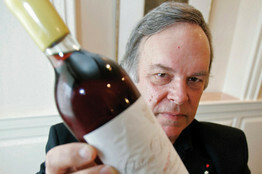 The key marker of this is the view of American wine critic, Robert Parker, who scores all wines on a 100-point scale. Mr Parker’s scores are published on his website, erobertparker.com. The Wine Spectator, which also scores wines out of 100, and the opinions of British wine critic Jancis Robinson are also worth checking. There are a number of brokerages and merchants who sell wine en primeur and store it, for a fee, under bond so that you don’t have to pay duty or VAT. The other investment route is through a wine investment fund. These tend to charge a 5% subscription fee, annual management fees of 1.5% or 2.5% and an average exit fee of around 20% of the upside. The Vintage Wine Fund, Wine Asset Managers and The Wine Investment Fund have all been authorized by the U.K. Financial Services Authority. It is important to note that in the past fraudulent companies have preyed on wine investors and it is still a largely unregulated market. And, although wine has fared better than most investments, there is always a risk that the price will fall. A recent example would be Château Figeac 2009 and the sweet wine Château d’Yquem 2009, neither of which have appreciated in value. The 2005 vintage of Château Figeac has fallen 2% since it was released on the market in 2006. Mr. Lyons is the wine correspondent for The Wall Street Journal Europe and is shortlisted for the 2010 Louis Roederer International Wine Columnist of the year. He can be reached at william.lyons@wsj.com. Sipping pinot blanc in a former mental asylum, I’m testing my decision to drink local wine during my annual summer stay by Lake Michigan. The whites at Left Foot Charley winery, housed in what was once the laundry of the state loony bin in Traverse City, are so crisp and savory they convince me my palate won’t suffer if, while here, I’m a “locapour”. The word means someone who’s committed to drinking the vino of the region — say, within a 100-mile radius to a half-day drive of wherever they are. Coined by the Globe & Mail’s Beppi Crosariol a couple of years ago, it’s become the liquid counterpart to “locavore,” the buzzword of the growing “eat local” food movement. When I travel, I’m usually a happy locapour. On Santorini this summer, I, and everyone around me, knocked back the Greek island’s edgy white assyrtikos every night with grilled fish. I did not feel Burgundy-deprived. Of course, I only stayed for a week. Drinking local in most parts of America (read: outside California, Oregon, and Washington State), though, used to be very tough. Not so long ago there weren’t that many wineries in states like Texas or Colorado or Michigan and quality was hit or miss. I still recall my reaction to a tasting of 100 Michigan wines here 20 years ago — I was only willing to swallow three. But wine is now produced in all 50 states, even Alaska, and ten have more than 100 wineries, inspiring website drinklocalwine.com. A lot of their wines are pretty good and, as with the best bottles in Michigan, many cost under $25. Reasons, in my book, to become a locapour. At Left Foot Charley, owner-winemaker Bryan Ulbrich fills me in on northern Michigan’s wine scene before I head to the tents on the asylum’s lawn for the annual Traverse City Wine and Art Festival, which features the 22 local wineries. He points out a relief map on a winery wall that shows two green fingers of land — the Leelanau and Old Mission peninsulas — jutting into a blue bay of Lake Michigan. Just a few miles from where we’re standing, these narrow promontories are home to the area’s vineyards. Yellow pegs on 18 mile-long, 3 mile-wide Old Mission mark where Ulbrich sources his riesling, pinot blanc, pinot grigio, and gewurztraminer. At his tasting bar, crowded with weekend sippers, Ulbrich starts me off with a zingy 2009 Dry Riesling ($20) with the slatey taste of wines from Germany’s Saar region. The exotic 2009 Gewurztraminer tastes of tart lychees ($20). A very spicy 2009 Rose ($15) made from cabernet franc, millot (a hybrid grape), and lemberger, known in Austria as Blaufrankisch, is gulpably delicious. Ulbrich produces no reds, though he consults with local wineries that do. “I’m very harsh about the idea of reds here. I say, what’s the point? My wife says to shut up about that,” he chuckles. The mental hospital closed in 1989 and a few years ago a developer began transforming the site’s several dozen yellow brick buildings into The Village at Grand Traverse Commons. In 2007, Ulbrich, along with bakeries, a coffee company and restaurants, moved in. I make my way through the Mercato, a series of food and clothing shops in spaces that once housed patients, to the festival’s big tents on the vast lawn. A blues singer tests a microphone; people rush for the food; and I show my plastic wristband at the entry to the wine tent. Ulbrich is right about the quality of the rieslings here — many are light, German in style, with fine flavors but often not much fragrance. Chateau Grand Traverse, the first to plant vines on Old Mission in the ‘70s, pours a fruity, steely-dry 2008 Dry Riesling ($12.50). I’m pleasantly surprised by the reds. A fragrant, berry- flavored 2005 Gill’s Pier Cabernet Franc/Merlot shows the region’s potential. Several cabernet francs remind me of Loire valley Chinons, especially the softly attractive 2008 Arcturos, Black Star Farms’ top label ($27.50). Shady Lane’s berry and plum-flavored 2008 “Blue Franc” ($23), a proprietary name for lemberger, has notes of cedar and a silky texture. Plenty of hip experimentation is going on. Circa Winery co- owner David Bell, in owl-style glasses, long straight hair, black shirt and pants, admits, “We don’t really like riesling.” Their 2008 Requisite blends cabernet franc and pinot grigio. While I’m certainly not giving up drinking international, there are pleasures to discover in becoming a locapour, especially during early fall. Just about every wine region will be holding a weekend tasting festival, like the one in Long Island wine country on Sept. 24 and 25. As an East Coast locapour, I’m putting it on my calendar. A rose and dry riesling are among the wines being poured at the tasting bar of Left Foot Charley Winery in Traverse City, Michigan. The winery, in the former laundry of a mental asylum, sources all its grapes from nearby 18-mile long, 3-mile wide Old Mission Peninsula. When I started this blog, I originally was going to focus solely on wine, but how could I talk about wine and not mention food? My lovely wife Lara is from the northwestern coast of Italy from a town called Genoa. And yes, ham and salami are very popular there, but what most people don’t know is that Genoa is most famous for its Focaccia bread. She has now perfected making this, and recipes will follow in due course. Below is a bloomberg review on the new Italian supermarket in Manhattan called silly enough, EATALY. This sounds like a fun place. Maybe one day my wife could open a shop there?……hmmm…..I miss New York…what a fun city. The line wound down Fifth Avenue from 23rd Street through Manhattan’s Flatiron district as security guards flanked multiple entrances to the former International Toy Center. The hubbub wasn’t for a nightclub; it was for the first American outpost of Eataly, an Italian supermarket with a marquee’s worth of food-world royalty attached: mega-chef Mario Batali, his business partner Joe Bastianich, chef Lidia Bastianich and Oscar Farinetti, who also backs the chain in cities including Turin, Milan, Bologna and Tokyo. Forget about the dopey name. Eataly is full of wonders. Is there greater culinary transparency anywhere? The profusion of reading material on the walls tells us that the Iowa pigs were raised on clover, Michigan lamb reared on hay, Montana beef allowed to roam in pastures and Pennsylvania calves kept outside of cages. Why get anyone else’s rotisserie chicken when you know this $9 bird is moist, well-seasoned and antibiotic free? The longer lines at Eataly are not for the take-away but for the restaurants. I waited 10 minutes just to speak with a host at a pizzeria that refused to serve me pizza — they were booked for the night. So I went to the fishery, where I was seated after 45 minutes. Ever go to a restaurant and think you could make it faster at home? Eataly provides the raw ingredients to follow through on that threat. “We eat what we sell; we sell what we eat,” is the mantra. I watched a live langoustine make a last ditch freedom attempt. Sorry bro. There are 14 places to dine at Eataly, four of them actual restaurants, five if you count the piazza where you eat nutty, salty prosciutto di Parma standing up at tables so high no shorties need apply. Take your glass of Prosecco or a super-strong Negroni and browse the aisles with caution. A 10-pound porchetta roast costs $193. Smaller portions were sold out by 7 p.m.
At Eataly, ambience takes a back seat to cuisine. Men in double-breasted suits quaff rose near the bottled chocolate milk station and I chewed through a $75 beef tasting menu while overlooking the olive oil department. That six-course meal took place at Manzo, which I’ll review later this fall after contemplating how I feel about paying $133 in a venue lacking a clean, nearby restroom. For now, I can vouch for the take-home stracciatella di burrata (extra creamy mozzarella) and a $5 basket of heirloom cherry tomatoes. The produce section’s maitake mushrooms, at $7 a pound, were cheaper and prettier than any I’ve purchased at Whole Foods. The people behind the meat counter were skinny while the vegetable butcher (his real title) was bald and fat. Go figure. Le Verdure, the mostly-vegan spot, serves real veggies cooked in olive oil and sea salt, as opposed to the silly soy-protein fake meat espoused by culinary crazies. Try killer tomato soup, vegetable fritto misto ($21) and pesto lasagna ($16 — with dairy) whose firm texture bested a version I had at Del Posto. I wish the restaurants would mix things up a little more. I couldn’t get pasta at Il Pesce, the fish spot, which dished out a pallid, underseasoned seafood soup ($12). Stick with the trio of crudo ($19) from Esca’s David Pasternack. Halibut belly with tangerine oil and pink peppercorns was a solid argument against overfished bluefin tuna. Finish with roasted orata ($24) which you debone yourself, after which the waiter congratulates you on your expert filet skills. They do serve fish at the pizza place, which I finally breached after an hour wait. Was it worth it? Not for undersalted fusilli in a paltry beef ragu. But definitely for what could be the city’s best seafood pizza, studded with a sufficiently briny (but not assertively salty) mix of creamy clams and squid over chewy, well-seasoned dough. Skip the “traditional specialty guaranteed” $18 pie with mozzarella di bufala — it’s indistinguishable from the $13 non- buffalo version. Like any great pizza, the olive oil just barely cuts the tomatoes’ acidity; the cheese is warm, not blistered; the over-charred crust just barely droops in the middle. A second visit (to the newly opened takeout stand) proffered a crust with a lighter, more bearable wood-oven tang. Just crave a slice? No problem. A focaccia hawker sells yeasty squares of dough topped with tart tomatoes and musty pancetta. If only the casual spot here served dessert; when dinner’s over, most of the (excellent) gelato is sold out. Below is a recent Wine Spectator article on which details an intriguing, albeit US biased survey about consumers’ views on value wines. What I found interesting was that according to the poll, the most reliable source of value chosen was South America, with 43 percent choosing Chile, followed closely by Argentina at 40%. Also 30% believe 15$ and under holds the best overall value, whil 29% favor $15-20$ range. Wine lovers continue to buy cautiously and are interested in good value more than ever, according to the results of a recent survey conducted on WineSpectator.com. “So many great values exist because of an oversupply of wine, that I am spending the same as last year but buying a lot more high quality wine for the dollar,” wrote a male consumer over 50 from the western United States. Thirty-eight percent said they were now spending less on wine compared with a year ago (24 percent are spending a little less; 14 percent are spending a lot less). By contrast, in the 2009 survey, 61 percent of respondents said they were spending less than they did the previous year. And while last year’s survey found only 10 percent of respondents spending more on wine, that number more than doubled this year, with 22 percent of respondents reporting increased spending. Younger wine drinkers are even more enthusiastic. About 48 percent report they are spending more money than a year ago. That’s a good sign for those watching the drinking habits of this new generation of wine lovers. “I’m still learning about wine, and the more I learn, the more I spend,” wrote a man in his 20s. Since everyone appreciates advice on a good bargain, we asked readers from which regions they would most like to have value recommendations (respondents could choose up to three regions.) Leading the pack in the New World, with 39 percent of the vote, was California’s Central Coast, which includes wines from Monterey, San Luis Obispo and Santa Barbara counties. In looking for advice on Old World values, there was a three-way tie among Spain, Bordeaux and Tuscany, each with a preference level of 41 percent. “South America is awesome in the value category,” wrote a 30-something male from the Midwest. Other New World regions identified included California, chosen by 36 percent; Australia, preferred by 34 percent; and Washington, at 29 percent. Among Old World regions, Spain led the way with 36 percent, while France and Italy tied at 22 percent each. The fact that high quality, low-priced wines can be made at all—given the costs involved from vineyard to table—is still a source of wonder for some. “I am always amazed that so many values come from faraway places. How much profit can be generated after shipping and distributor costs?” wrote one respondent. No matter what the price, red wine was the drink of choice among respondents, with 82 percent saying that at least half of the wine they consume is red. Only 13 percent said that for white. “I don’t drink whites,” was a common refrain echoed by a female consumer over 50 who lives in the West. For every 10 bottles consumed, 55 percent of respondents would include a single bottle of sparkling wine, but 28 percent would include none at all. Rosé fared the worst, with 44 percent not drinking a single bottle out of 10, and 42 percent drinking only one bottle of pink. As for which wines you consume most often, bottlings from North America dominate. Of every 10 bottles consumed, 62 percent of respondents said that four or more are from California, the Pacific Northwest and other regions in the United States and Canada. Sixty-eight percent said they drink one or two wines from Australia and New Zealand out of every 10 bottles; 69 percent said the same for South America and 45 percent reported that consumption level for Europe. Among female survey-takers, the numbers were a bit different. Just more than half said that five or more of every 10 bottles consumed came from North America. About 46 percent said one or two bottles were from Europe, while 43 percent choose a single wine from South America and 37 percent a single wine from Australia and New Zealand. Only a third of women said they are buying less wine than a year ago, while two-thirds were buying the same amount or more. In addition, while red was still the color of choice, almost 60 percent said that one of every 10 bottles purchased was a sparkling wine, and 40 percent said that one in 10 was a bottle of rosé. Finding high quality values that offer plenty of room for exploration in terms of flavor, type and style can be challenging, given the vagaries of production and distribution. But consult Wine Spectator’s Oct. 15, 2010, value charts or the Value Wines section of WineSpectator.com, where we include only wines that are made in good quantities, adhere to quality and price criteria and were tasted by Wine Spectator editors over the past six months, so many should be available at your local wineshop or grocery. If you are interested in finding the best values from California, Spain, Bordeaux and beyond, here’s your chance. You made the call, and these wines deliver the goods.